This is the original and patented QuitKick. Over 1000 have been sold worldwide and we are yet to hear of one that has not been successful in stopping the horse from door kicking. 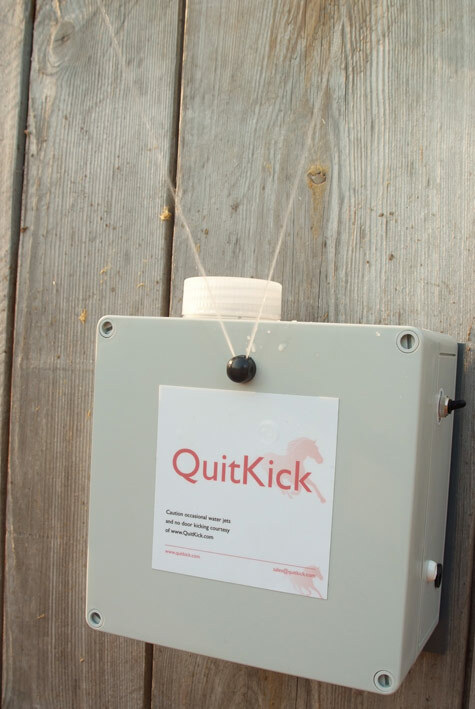 The Quit-Kick device is mounted on the outside of the stable door. Once mounted on the outside of the stable door the Quitkick detects, through electronic sensors, when the door is kicked by the horse. The device immediately sends two jets of water upwards in a one second burst. This stops the horse kicking the stable door. The horse is free to look out over the door as normal and the unit will not activate unless the door is kicked. The horse very quickly makes the association between kicking the stable door and the water spraying upwards. The horse does not associate the water spray with anything other than it’s own actions (Negative reinforcement). Through trials it has been found that typically horses stop kicking the stable door stable door in under two days.